This is the first in our regular(ish! )look at the ever expanding Star Trek Literary Universe in the hands of our newest SKoSTer Ian Kimmins. We will be following the post-Nemesis reading list here for reference as we progress! For many longtime Star Trek novel readers Michael Jan Friedman's name has been synonymous with quality Star Trek novels and this one is definitely worth your time. 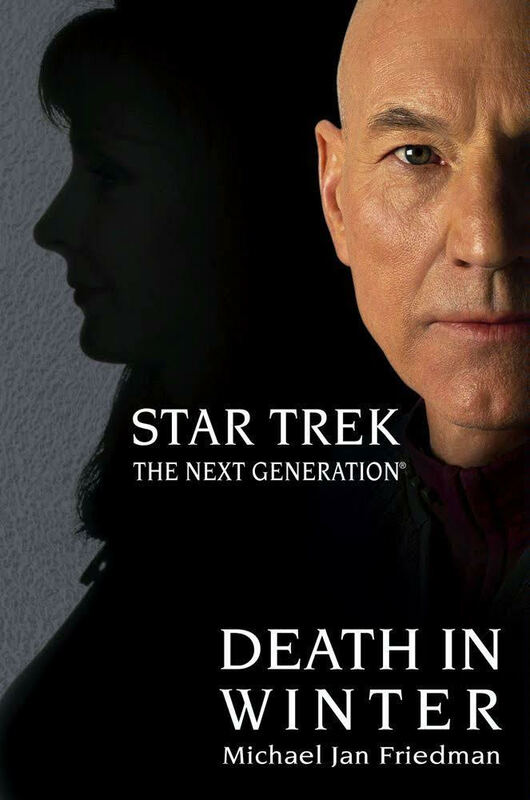 All throughout The Next Generation fans have wanted to see Captain Picard and Beverly Crusher get together. They have had a couple of false starts and even a divorce (All Good Things...) over the years but this is the book that sees them finally get together. As Death in Winter opens Picard is content to have Beverly as a close friend. However when Beverly decides that this isn't enough for her, she leaves the Enterprise to become Chief Medical Officer at Starfleet Academy. Captain Picard is just getting used to this when he learns Beverly is missing in action- and is presumed dead!! Naturally Picard wants to head to Kevratas - the world where Beverly was last seen. Starfleet agrees and Picard recruits two old colleagues from the USS Stargazer, Pug Joseph who has past issues to resolve and Doctor Carter Greyhorse, who has previously served time for murder. As the world they are travelling to is the far side of the Romulan neutral zone they recruit a mysterious Romulan who had left many years ago and never expected to be back. They must work together in the hope they can assist in helping the natives plague ravaged world and find out what happened to Beverly. Meanwhile Romulus is trying to recover from the events of Star Trek Nemesis and Shinzon's demise has led to his zealous supporter Senator Tal'aura grabbing power but there are many who oppose her including Commander Donatra. Naturally this leads to conflict between them and does set up one of the characters for future books. By the time this story wraps up the Romulan empire has been shaken to it core and some of the Enterprise's crew lives have been changed for good. While this is the accepted jumping on point for anyone looking to get into the Star Trek Literary Universe I found having read the A Time To series massively helped the story to flow much better. If you want to get stuck in you can start here and you will figure it out pretty quickly! Even though we pretty much know what way the book is going to end it is a lot of fun getting there. The adventure flies by and it is nice to see some characters who appeared in earlier novels by the author make an appearance. There are a few continuity points in this book that are later changed such as Janeway knowing Worf where as later on it is established that they don't! But as a book to launch the new literary verse I would highly recommend this! Check out and subscribe to our monthly podcast. You can find us on iTunes, Soundcloud and Stitcher by searching "Some Kind of Star Trek". Episodes one and two are live NOW!